Three amazing women-focused charities fighting homelessness in America. Here at Lonny, our mission is to help our readers create a home that empowers and feels like a true reflection of their personalities. But, for many, the luxury of decorating a home simply isn't a reality. With homelessness on the rise, living in a safe environment every night or even having a place to call home isn't a privilege everyone has. It is shocking to learn that not only are there 553,742 homeless people in America, but the amount has increased by .7% in just the past year, according to HUD. Even more upsetting? The amount of homeless individual women has increased by five percent since 2016. With domestic abuse and lack of mental health care serving as the main causes for women to lose housing security, the people who need the most help are often left with no support. Thankfully, there are some incredible organizations across the country that have made it their goal to give them the care they need. Of the 215,709 homeless women in America, 74% are in shelters most nights. 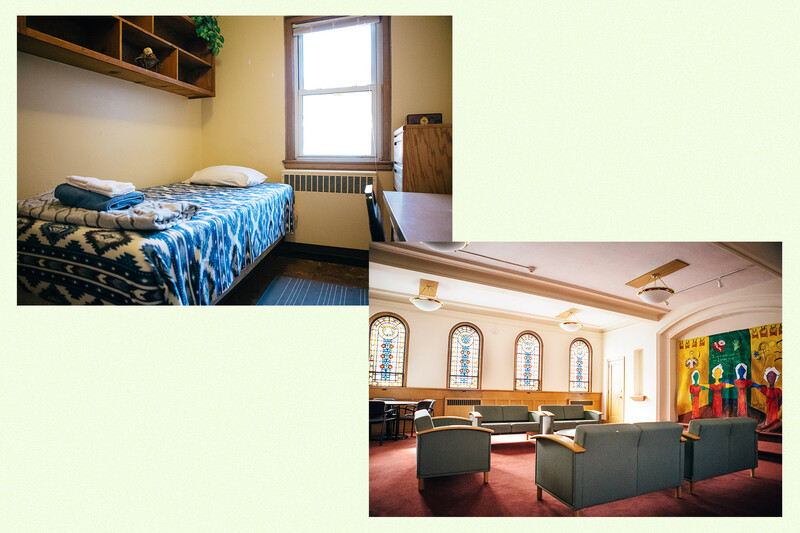 These spaces are a mix of emergency shelters, transitional housing, and even permanent housing created by charities geared towards creating a safe, welcoming environment to women that can not only give the basic necessities to live, but childcare, mental health care, and job training to recover and get back on their feet. To close out Women's History Month, we want to showcase some of these incredible organizations to not only give them recognition they deserve and encourage folks to give back, but also share their services to any readers who may need help. Courtesy of Downtown Women's Center. 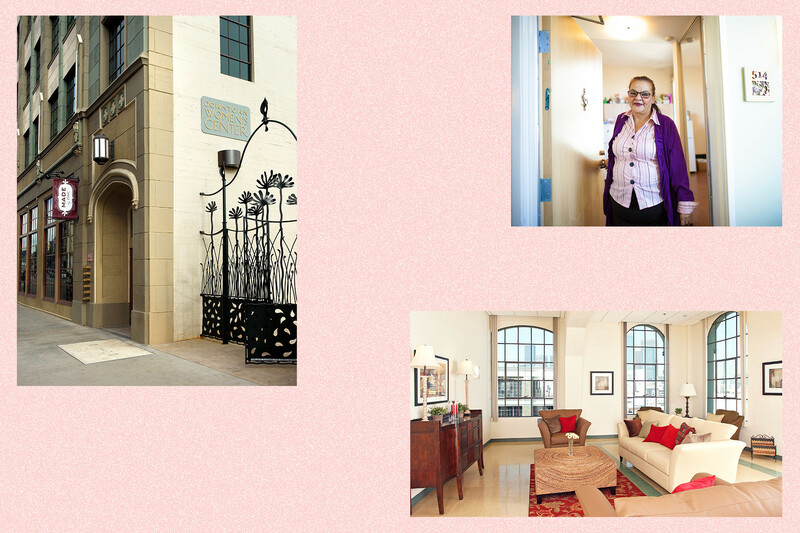 Located in Skid Row, the Downtown Women's Center has been a pioneer in creating sustainable care and housing for females at risk. "The DWC is the only organization in Los Angeles focused exclusively on serving and empowering women experiencing homelessness and formerly homeless women," shares Melissa Tillman, chief development and communications officer. "Our mission is to end homelessness for women in greater Los Angeles through housing, wellness, and advocacy. That starts with connecting women experiencing homelessness with safe, permanent housing, but housing is only one piece of the puzzle," she says. 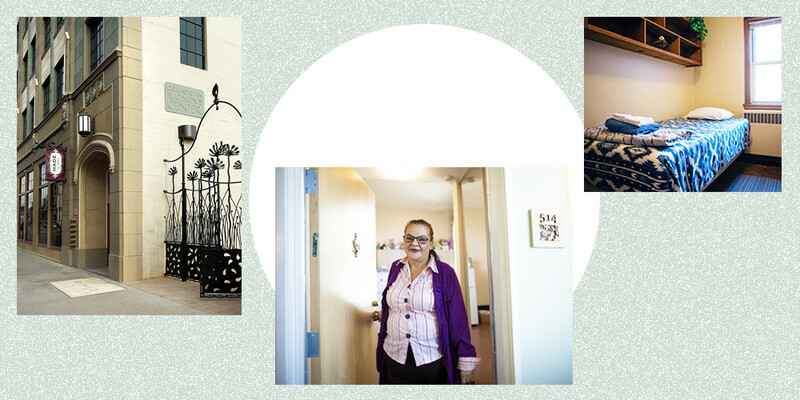 Not only does the DWC provide 119 units of permanent supportive housing for single, unaccompanied women, but they also coordinate residences for single women and female-led families across the Los Angeles area. "Individualized support and access to services are what help women achieve long-term stability," Tillman says. "We provide every woman who comes through our doors with resources and case management, including health care, education, job training, and trauma-recovery services." In fact, the organization has 1,000 annually use their workforce development services and provides the only women-specific health clinic in Skid Row. Having target facilities is essential to giving the female population the care they really need. The DWC also recognizes that while they can provide services for its location population, legislation is the next step to spark change to combat the lack of resources for the community. "We work with our elected officials to ensure women are not left out of efforts to end homelessness, and that their specific service needs are addressed," shares Tillman. Courtesy of Genesis Women's Shelter & Support. Since 1985, Genesis Women’s Shelter & Support has been a safe haven for Texas women and children who are victims of domestic abuse. “We exists to give women and children in abusive situations a path to lead independent and safe lives," says CEO Jan Edgar Langbein. "Our mission is to provide safety, shelter, and support for women who have experienced domestic violence, and to raise awareness regarding its cause, prevalence, and impact." While the organization already helps the 650 people who seek refuge in their emergency shelter annually, Genesis also offers long term housing in private apartments for 12 months after their stay. "Genesis Women’s Shelter was founded with a goal to not just help women, but to completely eradicate domestic violence, and we have formulated our services to address the issue holistically and give each woman the same message: there is help and there is hope," she explains. "Each year we see more than 1,300 women and children," notes Langbein. To create a holistic experience and further help these women and children experiencing trauma, the charity also provides more than 17,000 hours of non-residential counseling each year. "The women who come to us are in a fight for their lives," she shares. "We aim to walk alongside each woman and tell her she is not alone and she deserves a safe and happy life." With a focus on helping women experiencing extreme poverty and homelessness, Haven Housing provides a home and care to women and their children in need in the Twin Cities. “The mission of Haven Housing is to provide women a stable environment and the opportunity to explore options for their future," shares executive director Julie Kelley. 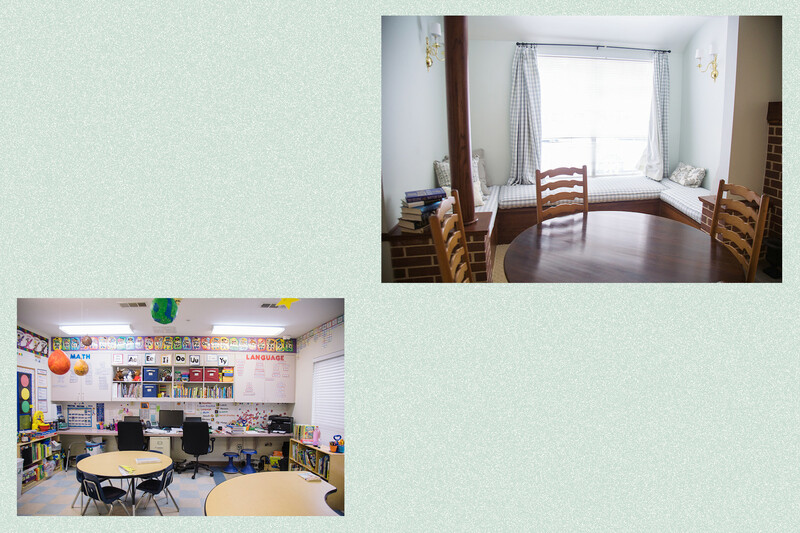 "Between our three programs (St. Anne’s Place, Ascension Place, and Next Step Housing), Haven Housing provides emergency shelter for single moms and their children, transitional housing for women, and permanent housing for women and women-led families." Within these three programs, the organization provides in-depth counseling for women with chemical dependency, mental health issues, and trauma in addition to supplying their basic needs. Family-based programs emphasize parenting help, keeping children active and in school, and wellness, while in individualized housing, each woman meets regularly with her case manager to develop and work on achieving personal goals. "Whether experiencing extreme poverty, homelessness, mental, or chemical health crises, violence, or abuse, our support services meet women they are. Achieving Haven Housing's mission would not be possible without our stable and supportive housing," she shares. "Having a safe haven and dignified place to live gives women the opportunity to heal from trauma, find a community in which to belong, focus on health and wellness, and take positive steps in their journey." While these three amazing organizations are taking action to provide support and homes to the women who need it most, there are others in communities across America striving to achieve this goal. We all should contribute to help everyone have a home, whether it may be through donations, volunteering, or even starting a new charity where there is a need for one. While we may not be in the position to give, remember that compassion, time, and a vote are three of the greatest tools at your disposal.